During the Battle of the Wilderness, Ulysses S. Grant's Army of the Potomac clashed hard with Robert E. Lee and his Army of Northern Virginia. The year 1864 was shaping up to be a critical one in the American Civil War. During the previous year, Federal armies had gained control of the Mississippi River and consolidated their grip on Tennessee. Only two significant Confederate military forces still remained in the field. In northern Georgia, General Joseph E. Johnston’s Army of Tennessee, having retreated from Chattanooga, was engaging Maj. Gen. William T. Sherman’s Union forces on their drive toward Atlanta. Meanwhile, in the eastern theater, General Robert E. Lee’s redoubtable Army of Northern Virginia was opposed by the long-suffering Army of the Potomac, still buoyed by its great, if incomplete, victory at the Battle of Gettysburg six months earlier. In February 1864, the ever-aggressive Lee planned once again to take the offensive. Recognizing that the Confederacy lacked the resources to gain a permanent advantage by a lengthy campaign in northern territory, he aimed to embarrass the enemy and prevent them from initiating a major campaign of their own. In mid-March, Lee learned that Lt. Gen. Ulysses S. Grant had assumed command of all Union armies. Toward the end of the month, northern newspapers reported that the new Federal commander intended to make his headquarters in the field with the Army of the Potomac. This indicated that Virginia would be his main theater of operations. Southern scouts confirmed that Grant had indeed joined Maj. Gen. George G. Meade at Culpeper Court House, a small Virginia town immediately north of the Rapidan River. 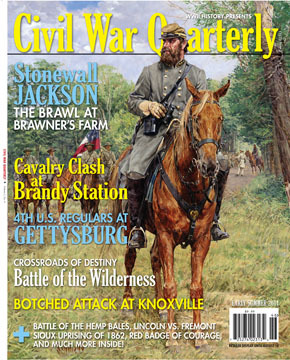 Inside “Crossroads of Destiny,” Jonas Goldstein’s feature inside the Summer 2014 issue of Civil War Quarterly, you’ll read all about Lee and Grant’s first ever wartime encounter. And as you’ll learn, the unforgiving terrain made the battle all the more difficult for both sides. When struggling young writer Stephen Crane flipped open a copy of Century magazine in 1893, the entire course of American literature changed. The Civil War’s greatest novel, The Red Badge of Courage, was born. With Union and Confederate forces massing around a key railroad junction of Manassas, Stonewall Jackson’s II Corps confronted Brig. Gen. John Gibbon’s Iron Brigade at the tiny hamlet of Groveton; it was a prelude of what was to come. Following the Battles of Chickamauga and Chattanooga, Union Maj. Gen. Ambrose E. Burnside squared off against Confederate Lt. Gen. James Longstreet in East Tennesssee over the strategic city of Knoxville. Determined to hold on to the crucial border states of Kentucky and Missouri, Abraham Lincoln clashed publicly with Maj. Gen. John C. Frémont, the famous “Pathfinder,” over Freemont’s hasty emancipation proclamation in Missouri. Brigadier General Robert McCook was the beau ideal of his predominantly German regiment. His murky death at the hands of Southern guerrillas sparked angry reprisals by his comrades. What do you think of Lee and Grant’s tactics in the Wilderness? How do you think their command styles affected the men who served under them? Let us know what you think about this and other features in this issue of Civil War Quarterly in our comments section. Tags Abraham Lincoln, Ambrose Burnside, Army of Northern Virginia, Army of the Potomac, Battle of Gettysburg, Battle of the Wilderness, Chickamauga, Emancipation Proclamation, general james longstreet, general joseph e johnston, Manassas, Rapidan River, Robert E. Lee, Sabine Pass, Stephen Crane, Stonewall Jackson, Ulysses S. Grant.